PRODUCT: 3 inch wide x DOUBLE thick Natural Bristle Paint Brush / Chip Brush / Pastry Brush. About 0.6 inches thick. Set in wood handle. 12/Box. Price/Box. Features 100% natural un-dyed taper cut bristles. 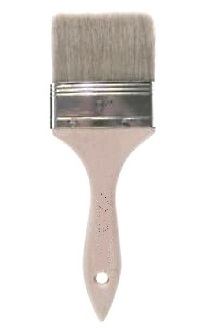 An inexpensive paintbrush useful in all fields.